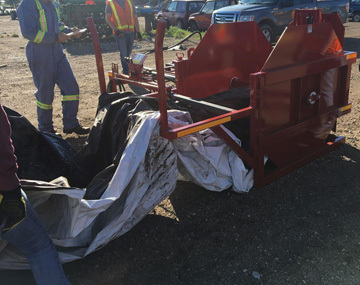 Alberta Agriculture and Forestry will assist ag producers in recycling plastics after it was announced recently that the government will help fund a three-year pilot program. The Alberta Beef Producers will use a $750,000 grant to coordinate the recycling program on behalf of the Agriculture Plastics Recycling Group. Its focus will be on recycling grain bags and twine, researching markets for other agriculture plastics not included in the pilot program, conducting a waste characterization study to determine agricultural plastic volumes and surveying producers to get feedback. The Government of Alberta conducted a study in 2012 and it revealed that around 50 per cent of agriculture producers were burning their agriculture plastics on the farm. “I think it’s a great program for our producers to assist them in getting rid of their plastics, twine, grain bags, anything that seems a little harder to get rid of ,” said Kennedy Fandrick, acting assistant agriculture fieldman for Cypress County. It’s going to take some time for county ag producers to use the pilot program, she said. “I did reach out to somebody from the Alberta government,” she said. Minister of Agriculture and Forestry O’Neil Carlier was on board to make the agriculture industry more sustainable. More details will be revealed in the coming months.